Kale is a herbaceous, green, leafy vegetable, which, together with, Brussels sprouts, cabbage and cauliflower belongs to the family of brassicas. From recently, it is the center of attention because of its valuable phytochemicals. This food is low in calories: 100 g of kale has only 50 kcal / 209 kJ of which 3.3% are proteins, 0.7% are fats and 10% are carbohydrates, but it is extremely rich in minerals and vitamins. Kale is excellent source of manganese, calcium, iron and magnesium. Also, kale is rich in vitamin C, vitamin K, vitamin B complex – thiamine and riboflavin, and carotenoids - beta carotene, lutein and zeaxanthin. Kale stands out from the family of brassicas as a quality food that can act preventively against cancer. Organic-sulfur components, such as glucosinolates effect on the various forms of cancer such as breast or ovarian cancer, because these phytonutrients neutralize potentially carcinogenic substances. Kale contains 10-15 species of glucosinolates. Carotenoids in kale are powerful antioxidants that protect cells from harmful free radicals. They act like a filter and prevent harmful effects of UV radiation on the eyes, protecting them from macular degeneration and cataracts. It should be noted that carotenoids enhance the immune system and thus help in fight viral infections. Beta-carotene from kale is converted into vitamin A in the body. Human body has multiple needs for this vitamin since it is essential for normal functioning of reproductive organs. It is significant for maintaining the epithelial and mucosal tissues in the lungs, bronchi principals, skin, mouth, and digestive tract and for growth and development of the bones. 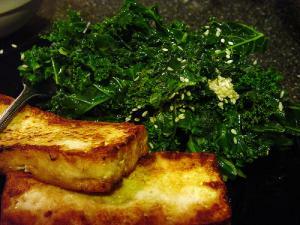 Kale should be eaten raw or lightly cooked in order to fully use the content of carotenoids. Vitamin C is one of the most important water soluble antioxidants in the body, which remains in considerable quantities after cooking the kale. This vitamin disables free radicals that cause the development of cancer. It also prevents cholesterol oxidation, which is then attached to the vessel wall and can cause cardio-vascular diseases, painful inflammations (asthma, osteoarthritis, rheumatoid arthritis), colds and ear infections. Vitamin C enhances the antioxidant activity of vitamin E, and also enhances iron absorption. Kale is a good source of thiamin and riboflavin which also prevent the damaging effects of free radicals. Riboflavin promotes energy production in cells and maintains the level of other B vitamins. Vitamin K is present in large quantities in kale. This vitamin participates in the synthesis of blood coagulation factors. Kale is an excellent source of manganese that is involved in the process of obtaining energy from protein and carbohydrates, and participates in the synthesis of fatty acids which are necessary for maintaining a healthy nervous system and is important in the producing cholesterol for hormone production. Kale is also rich in calcium which is required for maintaining bone health, but unlike milk, which is being promoted as a good source of calcium, kale has a lot less calories. Dietary fibers, highly represented in kale, are cellulose, hemicellulose, poly-fructans, galacto-oligosaccharides, pectines. These fibers have beneficial effects on digestion, maintain normal cholesterol and sugar level, regulate bowel function and maintain the intestinal microflora. They also increase insulin sensitivity and thus prevent the development of type 2 diabetes. Dietary fibers provide a feeling of fullness; reduce the risk of colon cancer and hemorrhoids because they speed up the content transport through the colon.